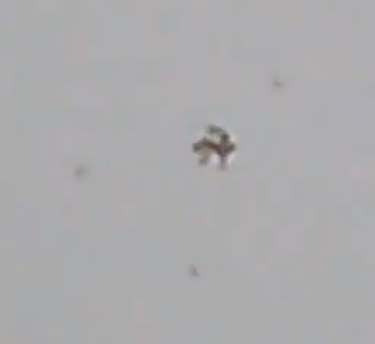 I was in the garden on 12th March 2012 and noticed this weird object (or collection of objects) in the sky. As I had my phone on me I managed to get the video shown here. It was moving in an approximate North to South direction. It was recorded at 4.29pm BST coming in from the Irish Channel and moving inland. My guess is that it may be an escaped bunch of balloons but the regular outer triangular formation is similar to the famous triangle-shaped UFOs seen around the world....so you decide! BEAMS Comment: Ah, balloons you may cry, but look closer... observe the triangular formation on the outer edge of this cluster... would mere 'balloons' hold such a tight formation? we think not. Although these are still technically 'unknowns', cryptids, biological aerial anomalies... entities would be a better class, than one so obviously difficult as a balloons categorization.